I love when fresh pineapples are on sale and I always stock up. I used some of the leftover Voodoo roasted pineapple to make granita, and then I used some fresh pineapple to make sorbet. Granitas are about the easiest frozen dessert you can make and you do not need an ice cream maker or any special equipment. 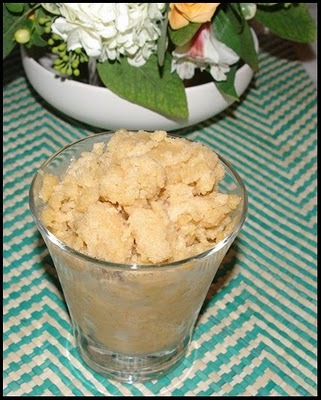 The granita recipe is from Food & Wine and it calls for 4 ingredients--water, pineapple, sugar, and a pinch of salt. It takes about 10 minutes to prepare and then time to freeze. The granita is so delicious it's hard to believe that it's dairy free. The pineapple sorbet recipe is from Saveur and it requires only 3 ingredients--pineapple, sugar, and lime. The base for both granita and the sorbet is very similar--pureed pineapple. The granita, being mixed by hand, results in an icy, sort of crunchy frozen treat. The sorbet is smooth and creamy, the result of the extra processing in the ice cream maker. I like both equally as well. I had so much pineapple that I made two batches of the sorbet, and in the second batch I added some fresh raspberries. The berries added a bit of sweetness, and also turned the sorbet a lovely pale pink. (I have a thing for pink food). I also used some of the pineapple to make a simple vegan Pineapple Upside Down Cake. It's a very easy recipe but it makes a lovely moist cake. If you do not have fresh pineapple, you can of course use canned pineapple chunks. Granitas are so colorful and your versions look great. It all sounds very good, but I'm really liking the looks of that raspberry pineapple sorbet! That sounds so good! They all look delicious! Pineapple and lime sounds especially good!